Already next week, on May 6, we will meet in Madona Karting track to officially and jointly start writing 2017 Latvian karting season book. These will be this year's first race, where each participant and the team will be able to show what have been done in season preparation phase. At the same time there will take place the Latvian Open Karting Championship Stage 1 and the Pro-Kart Cup Stage 1. Season will be long enough, and it is hoped that exciting, so before you ran the track, we want to tell you about some big and maybe not so big news that we expect this season. This season ahead 6 races, which will hold the Pro-Kart organization- Latvian Karting Open Championship, Pro-Kart Cup, as well as Rotax Challenge Cup will take place in the same race weekends. The exception is the one race, the Nordic Cup, which will take place in 03.06. In these competitions are not included - Latvian Karting Open Championship and Pro-Kart Cup, but there will take place Latvian Rotax Challenge Cup test. These competitions will be organized by SK333. One of the major novelties of this season - races will be broadcasted online www.sportacentrs.com website, news site www.tvnet.lv , www.prokart.lv our website and our Facebook page. As well as it is expected that the closing races, which will take place in the renewed Smiltene track will be broadcasted on television. This year's Rotax Challenge Cup Latvian athletes will compete for 6 places on the Grand Final, which this year will take place from 04.11. - 11.11., Portugal. As well as this year allocated places for all Rotax classes. Jelgava street race this year will be organized by another organizator and the Baltic KZ2 championship this year is not planned. In contrast, pre-season 05.01. there will be held Kandava city Cup, which will be organized Mareks Štolcermanis. Also this year will continue the successful cooperation with LMT Autorsport Academy, which this year joins another 4 educational institutions, a total of 15 karts. Academy riders, as previously, will be calculated in its schools Cup score and the Pro-Kart individual score. Raket class has changed its name to R85, essentially nothing has changed. This is done due to the fact that this class also allowed Mini60 engines and Raket name a little confused people. It is planned that Retro class this year will be only 3 races. On 20.05. SK333, 15.07. Kandava and 30.09. Smiltene. As well as significant the fact that TK Senior class introduced in the inlet restrictor, which is purchased at the race organizer. Restrictor fee 5 EUR. The participation fee for small classes (R85 TK Junior, MicroMax, MiniMax) 35 EUR, adult class 40 EUR, 20 EUR transponder rent, friday's workout fee 30 EUR. If you have not previously logged in the competition on the internet, the more expensive membership fee of 20 EUR. Team registration fee of 30EUR. On licenses. 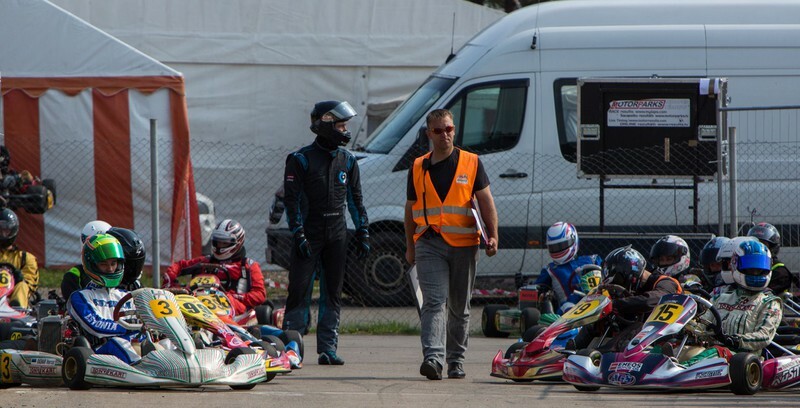 Pro-take tests athletes may compete with any of the LAF Karting license, while the Latvian Karting Open Championship may compete with athletes at lower grade license as "C". If an athlete with a "C" license applying to participate in the Pro-Kart Cup, then he can not fight the Latvian Championship test. In other words, the athlete beginning of the season to choose where to start the final test, both start at the same time is not allowed. All copies of the originals with the regulations of the LAF approval can be obtained at the office of the LAF. About 6 May race at Madona. It should be noted that the registration of participants, the scrutineers and tire issuance, on Saturday, will take place from. 8:00 to 8:30, after which will follow the shareholders' meeting. We remind you that participation in the meeting is mandatory. Participants stand opens on Thursday 04.05.2017 from. 08:00. Participants Park site are granted only competitors. Space is not pre-booked. Organizers allocate them in the order in which players come to shed. As well as participation in the award ceremony is mandatory. The total estimated duration of the competition 05.06.2017. It is from. 8:00 plkst.18:00. As well as a great reference for all athletes to inform about their outside Latvian upcoming matches and their results - Pro-Kart media and press person Sabīne Leingarde / e-mail: sabine.leingarde@gmail.com / 28355507 or new LAF press officers – Kristīne Pavlovska / e mail: prese@laf.lv / 28344187. Do not hold a candle under a bushel, because we really want to write about you, so that everyone knows how cool and talented athletes we have! Success, willpower and a spark in the eyes of all athletes and teams from the first race of the season to the season last race! Video tiešraides komentētājs nu gan varbūt varēja labāk nebūt. 50% no teiktā ir pilnīgas muļķības. Super, varam sekot kartingam pat Njujorkaa! No translaacijas gan nevar saprast vai tas ir arii Pro-Kart posms? Apsveicu ar sezonas saakumu un prieks par attiistiibu. Cik maksās ieejas biļetes skatītājiem un kur tās būs iespējams iegādāties? Tiešām, VISUS kartingus pusstundas laikā?